A classic that’s been around forever, Grandma’s Depression Cake has stood the test of time. You will love to learn how to make this old fashioned favorite and it’s so easy. Any cake that has been around for decades has to be a great one. This Great Depression Cake certainly is a keeper! Simple ingredients and unique flavors make it a quick and easy dessert that you’ll love. Wendy of Wendy’s Kitchen Table is sharing her recipe and she also has a video to step you through the process. This quick video tutorial shows you how to put this easy cake together from start to finish! Preheat oven to 180˚C or 160˚C fan-forced. 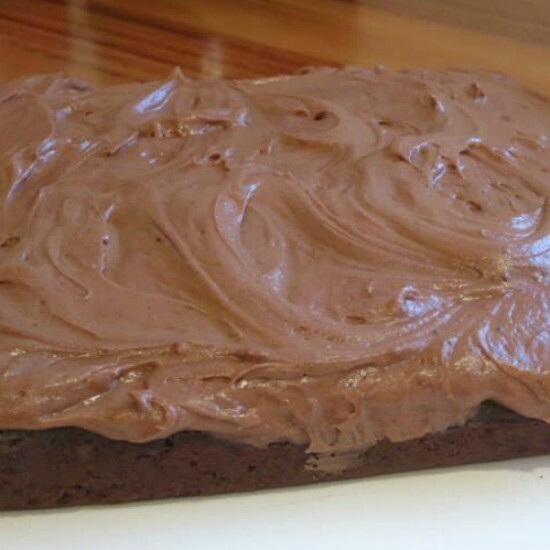 Grease an 8-inch square cake pan. Combine flour, cocoa, sugar, baking soda and salt in a cake pan and stir. Create 2 small and 1 large depression on the surface of the dry ingredients. 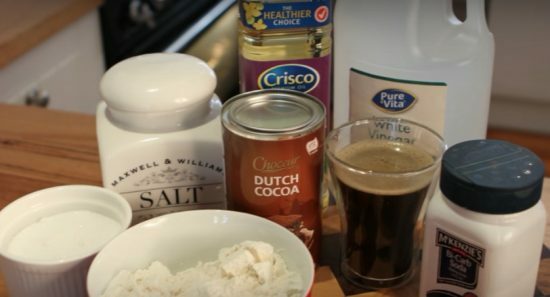 Pour vanilla and vinegar into a small depression and vegetable oil into the large depression. Pour water or coffee over the surface and stir until batter forms. Ice with chocolate frosting if desired.